Garnish with another mint leaf and some lime! 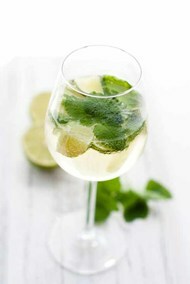 Fill your glass 3/4 full of Prosecco - add mint leaves. Top up with the cordial/liquor and sparkling water. You can also add a slice of cucumber if you like. Place the strawberries (about 10) in a blender and whizz up - you can then sieve them if you like. Spoon into your glass and top up with Prosecco. Garnish with a sprig of fresh mint or a strawberry. Put the fresh or tinned peaches (and the syrup) in a food processor and liquidise until you have a smooth liquid. 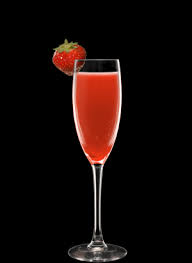 Place about 2 centimetres worth of the puree into the bottom of your glass, and top up with Prosecco. 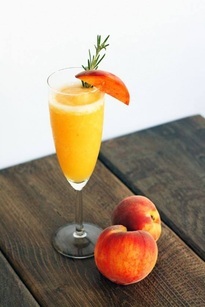 Garnish with a peach slice, and a sprig of rosemary! I look forward to seeing your pictures at the weekend - Cheers! 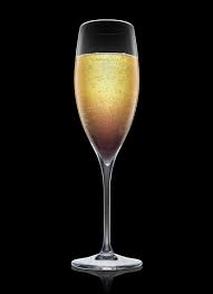 Method - add the cordial and liqueur to a chilled champagne glass and top up with Prosecco! of the prosecco until fully incorporated. While whisking, slowly pour in the vodka and then the remainder of the prosecco. 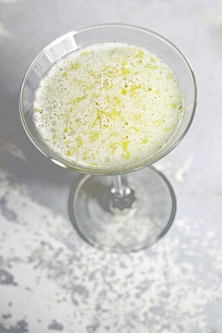 Serve in a martini glass or coupe and garnish with some lemon peel.